When the Pirates need to stop a losing streak, they send out their stopper. Francisco Liriano has become the stopper. He and the Pirates are now 12-4 in his starts after beating the Colorado Rockies 5-2 on Saturday night, and by doing so stopped a two-game losing streak from turning into a losing skid. Winter’s best free agent signing pitched seven shutout innings, struck out six batters and allowed only two Rockies hits, and Liriano continues to build himself back to his All-Star form and construct a case for Cy Young Award contention. For his part, Liriano agrees. He walked five batters Saturday but did not allow any of them to score. Catching Liriano is like playing a video game. Any pitch, any count, any time. Liriano certainly received offensive assistance as the Pirates got 11 hits and scored one run apiece in innings 3 through 7. 4th Inning: Jose Tabata rips a full-count fastball from Rockies starter Jorge De La Rosa for a home run to right-center, his third of the season and first since May 11. 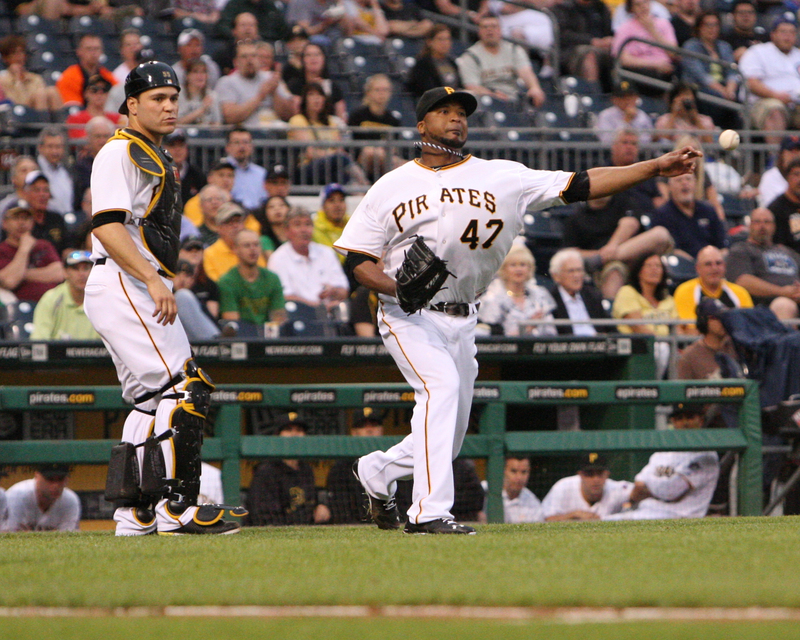 5th Inning: Marte draws a leadoff walk, then Jordy Mercer lines a single to chase De La Rosa. Two batters later, reliever Adam Ottavino gives up a chopping RBI single to Gaby Sanchez. 6th Inning: Tabata leads off by lacing a triple to left-center and scores on Josh Harrison’s suicide squeeze bunt. 7th Inning: McCutchen hits a two-out single to left, steals second then scores on another Gaby Sanchez RBI single off Ottavino. Tony Watson got knocked for three singles in his four batters and charged with two runs, but Bryan Morris drew a double play to end the 8th and Mark Melancon pitched a 1-2-3 inning for his 6th save. Here are three things that are not stopping: The Pirates have baseball’s best record, they are 1.5 games ahead of the St. Louis Cardinals to lead the National League Central and they sit 8.5 games ahead of any NL team looking to get into the playoff picture. When are fans going to realize the Pirates are better vs LH starting pitching than RH? Marte, McCutchen and the catchers kills lefties. And Gaby vs lefties >>> Jones vs righties. It’s pretty amazing to think that if the Pirates go on a hot streak and go 34-18 the rest of the way….it would be a 100-win season…. Unlikely, but not totally out of the realm of possibility anymore. When will Liriano finally have enough innings to qualify for the Earned Run Average leaders? Once he finally does, the Pirates will have two of the best in the top three. Innings Pitched have to be greater than Team Games Played. Right now Liriano has 102.2 innings and the Pirates have played 110 games. I provide some of the math in the story.